It's time to talk videogames – next generation videogames, that is. How many of you hopped on the 'next gen' console wagon like me? We all can agree that grabbing a new gaming console at launch is always a risky proposition. Sure, the PlayStation 4 and Xbox One have a suite of features that we all can drool about, but what about the actual games? Recently, a nice set of new game releases has helped usher in this next generation of gaming we've all been promised. Games like Infamous: Second Son and Titanfall have shown us the next step of next gen. Unfortunately, the latest "next gen release," WATCH_DOGS, seems like a step back. Heck, even Nintendo, who seemed down and out of this next gen race, is back in fighting action with its latest stellar release of Mario Kart 8. But I want to talk about an awesome game that few of you may know about that was also recently released on PS4 and PC: Supergiant Game's Transistor. I'm a sucker for indie games, and Transistor is one of the reasons I purchased my PS4, not WATCH_DOGS. Transistor is a game about a woman named Red. As the curtains draw, we see Red mourning over her deceased lover as the Transistor, a giant translucent blade shaped like a circuit board, juts out of his abdomen. 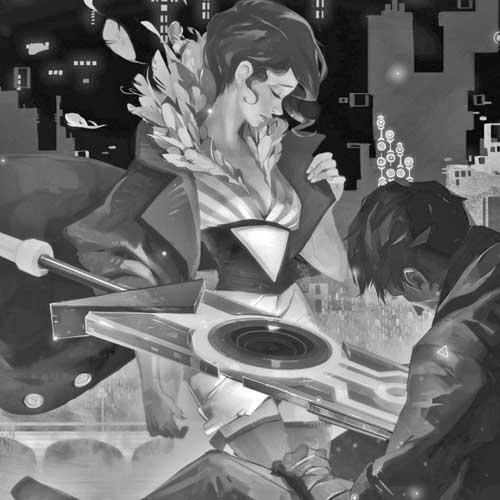 The Transistor communicates to the player, "Hey Red, we're not going to get away with this are we…" It then orders you to retrieve the sword and you and it/he are on your way. But what is the Transistor? This question is never truly answered. It's obvious that it's a weapon of immense power. It is also sentient. It seems to have captured the soul of your deceased lover and now he uses it as a conduit to Red, a.k.a. you the player. A signature of Supergiant's body of work is the steady stream of narration that occurs. The Transistor is not only the key source of conflict in the game, it is also the device used to expose the story to the player. It is all delivered as if a close friend was trapped inside and is now guiding us through the hazards the game is presenting. It helps us as players understand the world at large in a seamless and engaging way. The first discovery we find is that Red has lost her voice and a mysterious Illuminati-esque group called the Camerata has taken it. We also learn that they were the cause of the Transistor killing our unnamed lover. The Transistor urges us to flee, but Red has one thing on her mind – and that is vengeance, which is when and where the game really becomes exciting. Narratively, the game is superb. Bits of information and facts of the world trickle in as we piece together where we are, who we are, and why all this is happening. It is not like the average game where cut scenes dominate and we are beaten over the head with whatever nonsense military jingoistic teenager plot the writers dreamed up in fervor. Instead, voiceover contextual narration occurs to help fill in some of the gaps. But like all good fiction, we the viewer are expected to invest and help flesh it all out. Things are left purposefully ambiguous, which allows us to interpret what we experience. But narrative isn't enough for a great game, is it? Transistor in action is just as smart. What starts off to be a seemingly simple run around and mash your attack on enemies as they crop up ultimately turns into something much more thoughtful. Players can institute what the game calls a Turn(). During this action, time dilates and the player can queue up a series of actions. We are now tasked to think tactically and all of our actions now carry more weight, because after the command is issued, we are left vulnerable as we eagerly await the Transistor to recharge allowing us to take a Turn() again. It's a smart hybrid of traditional button mashing and thoughtful tactical planning. As the game progresses and the story unfolds, we unlock new skills to play with. Further along in the game, we get the ability to augment moves with other moves. As an example, we get an attack that shoots out a piercing projectile that will go through walls and multiple enemies. We then can combine that to another skill that normally shoots out a cluster of explosives; the result is a piercing projectile that splits in three directions. The reason this is worth mentioning is that it allows for players to find their own style of play. In other words: Do you like to charm enemies and sneak around looking for backstabs? Yep, there's a skillset for that. It is difficult to talk about Transistor without talking about Supergiant's first game Bastion. Bastion also had the similar trappings of an omnipresent narrator akin to the Transistor and it also had a striking visual style. Bastion was a successful debut game for a small, indie studio because it felt fresh while building off of what was already familiar. That's what I would say is the Supergiant signature, there is always this feeling of familiarity. Both Bastion and Transistor feel like a well-worn pair of shoes in which you just feel like you know what to do before you are prompted to do so – even if you're taking steps in directions you thought you'd never go. So I strongly recommend you check out Transistor, which is currently available on PlayStation 4 and PC. The soundtrack also KILLS and I haven't been able to stop listening to it.